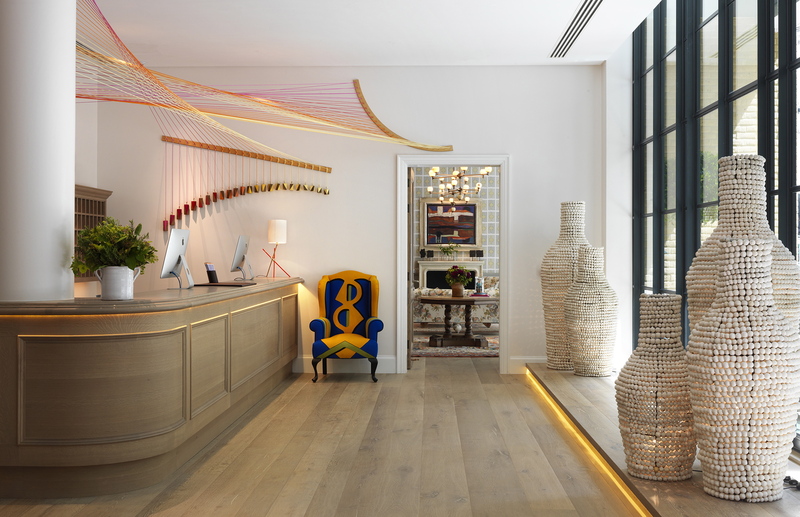 Arriving at the recently opened Ham Yard Hotel the first thing that strikes you is the quite astonishing location. A two minute stroll from the impossibly busy Piccadilly Circus finds this sleepy backwater. Calm, relaxed and peaceful – who would have believed such an oasis really existed within 50 yards of the busiest address in London? It is also hard to believe that this little patch of prime London real estate has remained until now, an almost undeveloped World War Two bomb site awaiting discovery by Firmdale Hotels. The group, owned by Tim and Kit Kemp, after four years of careful work, have added to a prime-location portfolio that already includes an impressive list of hotels: Charlotte Street, The Soho, Covent Garden, Dorset Square, Knightsbridge and Number 16 (reviewed by CELLOPHANELAND* here) whilst internationally their wings have already spread to New York. Next stop? 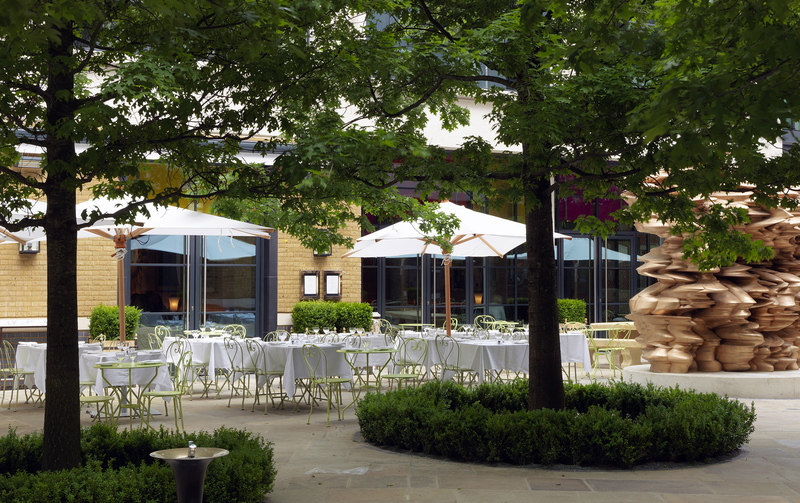 The exterior of the hotel opens on to Ham Yard itself: a delightful tree-filled courtyard with two areas of outdoor seating – bar and restaurant. An impressive Tony Cragg sculpture dominates the area, and is worth the visit on its own. The reception, as well as the hotel in general, is unpolluted by named branding. No illuminated big name hotel signage here. 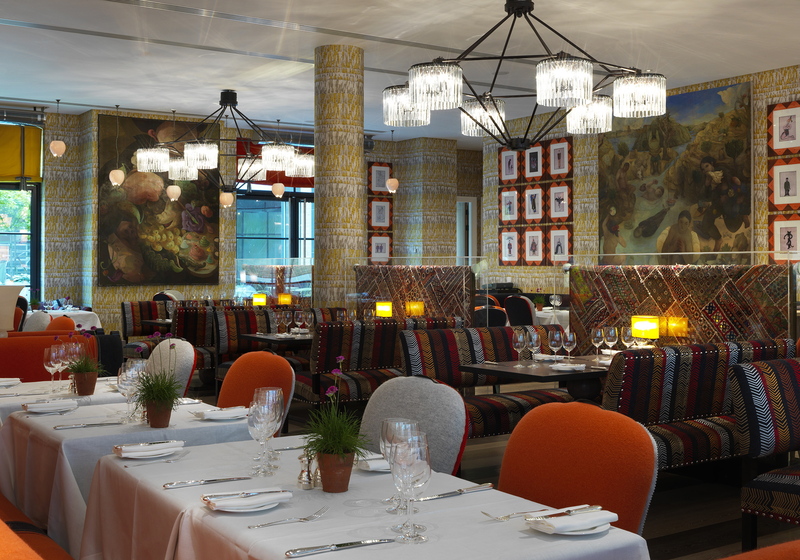 Everything is discrete and understated, except the extravagant design which is effectively the Firmdale brand. We are immediately and impeccably greeted, rapidly checked in, and shown to our room via the impeccable public spaces. 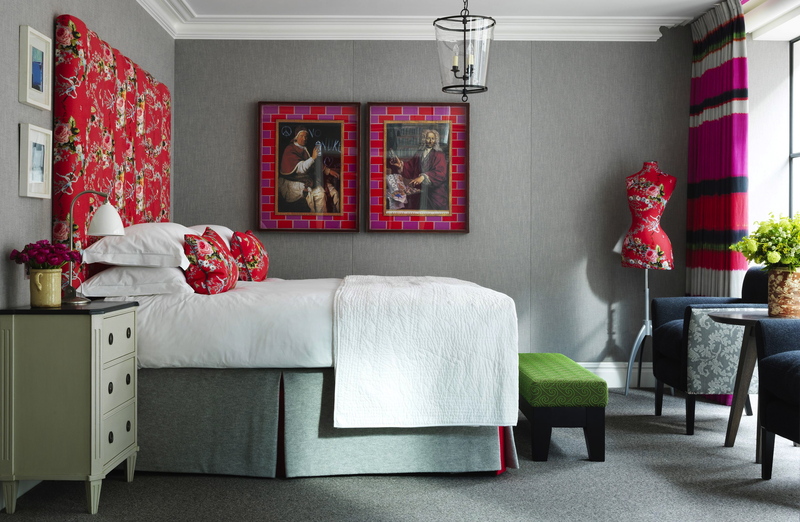 As with the other Firmdale hotels, the impressive interiors have been designed by Kit Kemp herself. Award-winning ‘Modern British’ in style, the look is astonishingly eclectic. No two of its rooms apparently are ever the same. 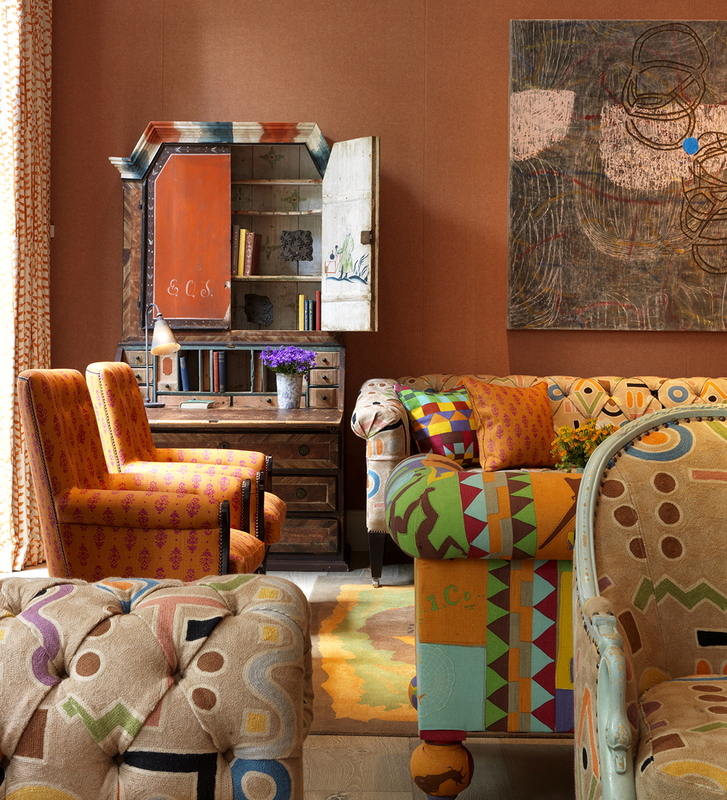 Re-imagined antique sofas in bright contemporary fabrics are juxtaposed with by native artefacts, contemporary art and angular modernist lamps. A wide variety of colours, shapes, and patterns is de rigeur for all furnishings whilst handicrafts, antiques and objets d’art abound. Every square feet of available wall is tightly hung with pieces by anyone from icons like Howard Hodgkin to local art students. 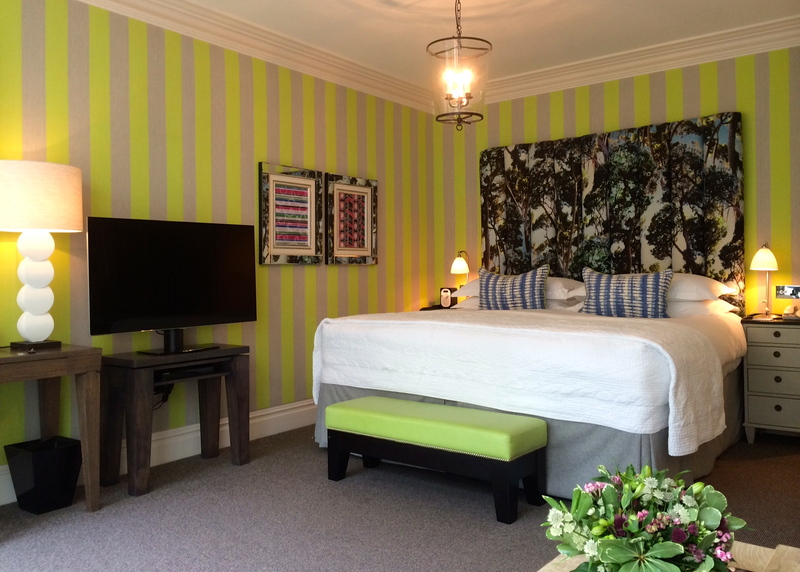 Our bedroom (one of the hotel’s total of 115 rooms, suites & apartments) is acceptably peaceful despite overlooking a bustling evening courtyard whilst it’s decor is again suitably ‘Modern British’ with lime green, grey and blue the predominant colours. The bathroom is stunning with floor to ceiling granite tiles, a big glass shower and a bath with a built-in TV at its foot that we of course had to test out. 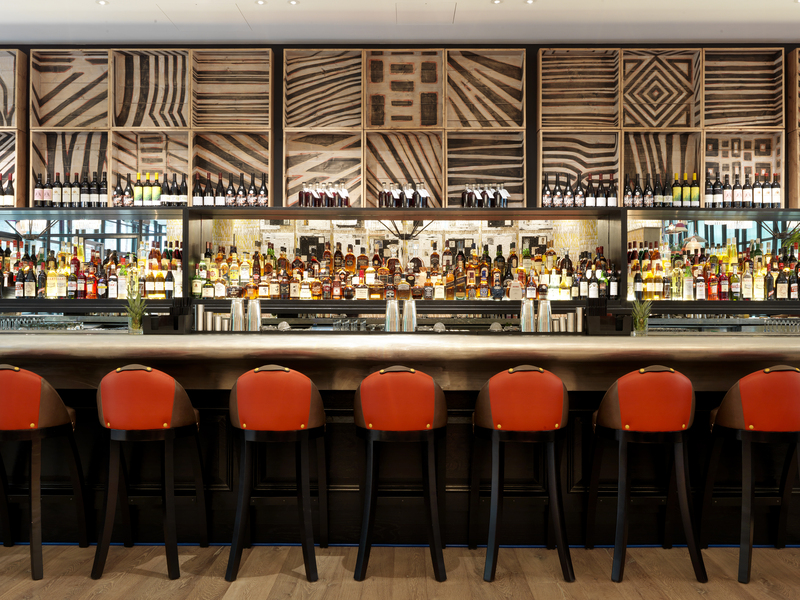 Utilising every inch of its premium central London location, Ham Yard’s rooftop space is taken up with a garden bar that has sweeping views of the Soho skyline. 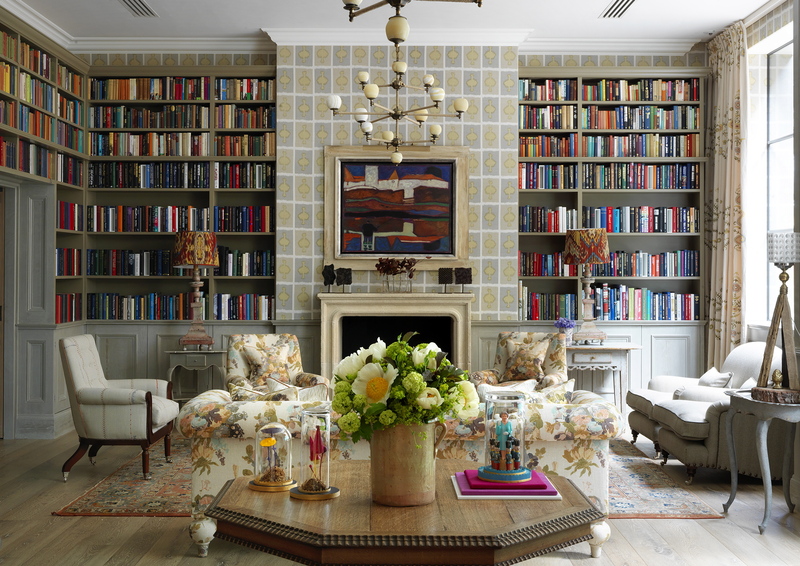 Downstairs, as well as the excellent restaurant, there is a bar – naturally busy and bustling around the weekend – a drawing room, and library. 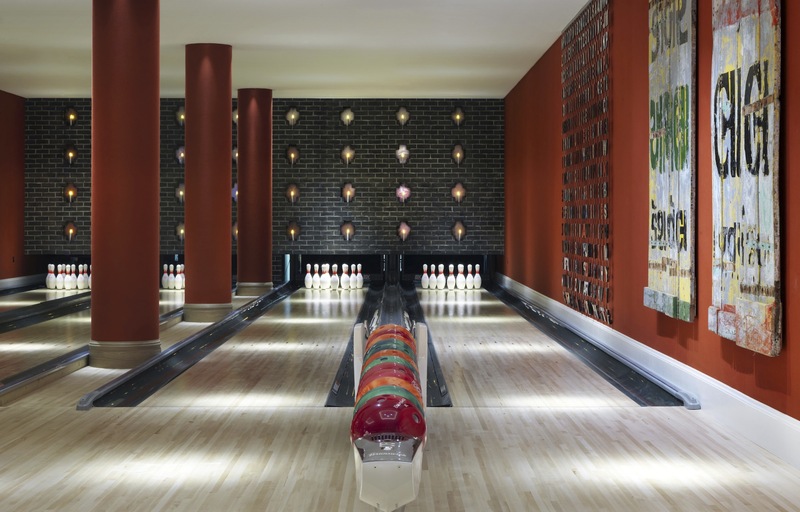 Lower down in the basement are the Soholistic Spa and Gym, a luxury 190-seat screening room, several private event rooms, and the fab 1950’s style Croc bowling alley that was specially imported from Texas. This is a hotel with a broad appeal. We took advantage of the central location to attend an event at the Royal Academy and visit some Mayfair galleries. Tourists may select it for the perfect central location or for business it’s handy for the city. It’s also an ultra cool place to see-and-be-seen or just to hang out. And if you want to be handy for Piccadilly Circus… it’s perfection! Images by CELLOPHANELAND and Firmade Hotels. CELLOPHANELAND* were guests of Firmdale Hotels.